Mountains and rivers isolate Galicia from the rest of the Iberian Peninsula. The terrain is green and hilly, with the greater part lying at elevations between 600 and 2000 feet (200 to 600 meters). Its more than 800 mile (1300 km) coastline on the North Atlantic is characterized by a series of sea inlets called rías . James Michener possibly described Galicia’s coast better than any other writer: “The glory of Galicia is its chain of rías , those fjord- like indentions of the sea that reach far inland with a burden of fish and salt air and noble landscape.” Someone else described Galacia as “a land of a thousand rivers”. 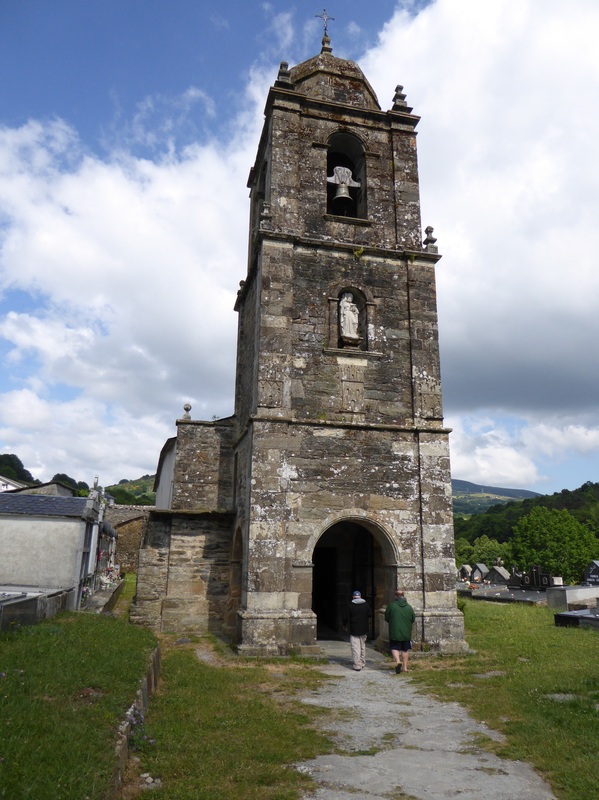 Galicia’s history dates back to around 600 B.C., when Celtic groups settled the region. In the 6th Century, the Visigoths( nomadic Germanic tribes) colonized the land, followed nearly 500 years later by a brief Moorish occupation which ravaged several towns, including Santiago de la Compostela. North western Spain was not under Moorish rule nearly as long as the rest of Spain. It was from here that the Reconquista began. With the deification of St. James, the Christians found a match to the Koran-inspired fanaticism of the Moors. Santiago became known as “Matamoros” (the Moor slayer). In the 1930s, the Spanish Civil War devastated Galacia’s local economy; many young Galicians left their homeland. In 1936, the Spain granted Galicia regional autonomy and officially recognized its language. However, Galician-born General Franco outlawed the language and restrained Galician autonomy until his death in 1975. The Galician language, Gallego, helps set this region apart from the rest of Spain and is a major source of pride to Galicians. Locals generally speak standard Spanish, but about 3 million also speak Gallego, a centuries-old Romance language similar to Portuguese. Although there are no tartans, Galacia is where flamenco meets River Dance. The strains of music that greeted us atop O Cebreiro were lilting and remarkably Gaelic. We are hoping to come upon a festival or even someone playing the gaita on a village street. The Triacastela Chapel, originally built about the time of Columbus. There is a Pilgrim’s mass held there every evening. We attended along with young and old, from every corner of the earth. 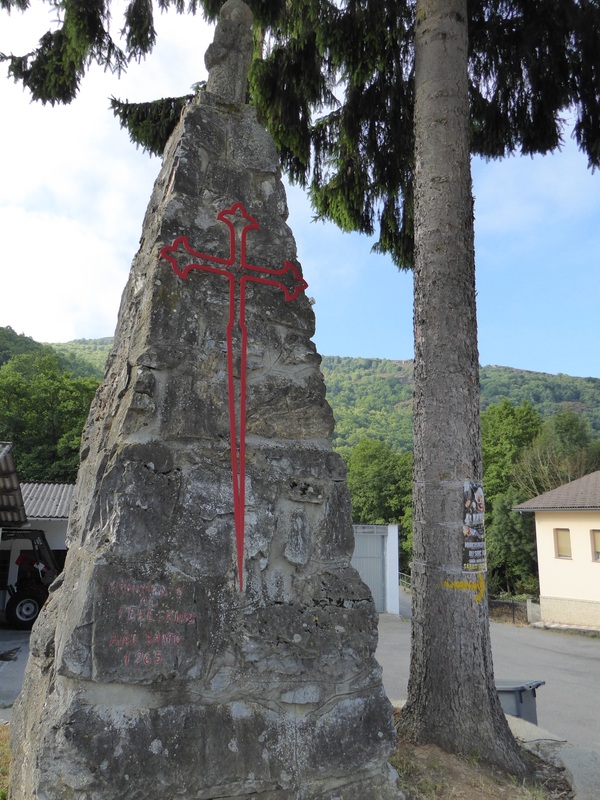 Set in a huge stone on the outskirts of Triacastela, the symbol of the Templar. 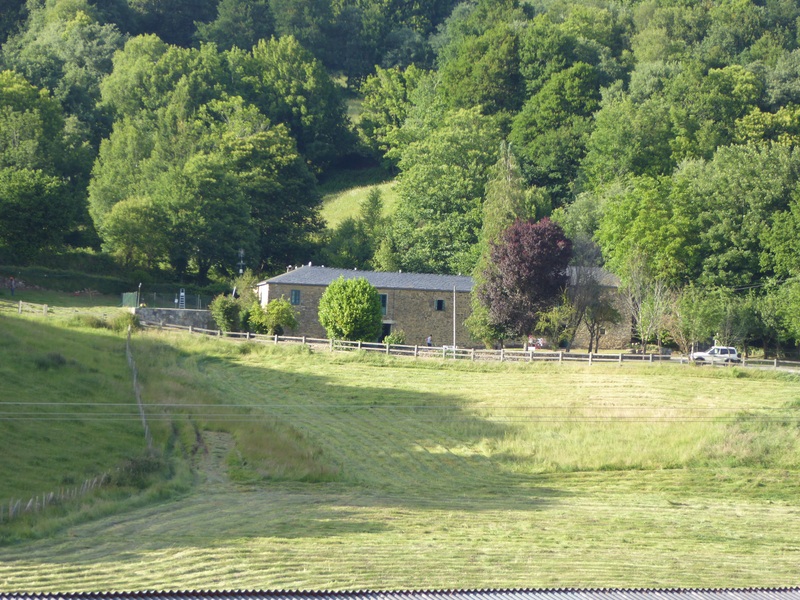 Kind of an ominous sign to see, particularly when drawn in red…..
Set away from the Camino, this was our home for two nights. Originally a rural manor, housing a wealthy land owner, its main dining room heated by a huge open fireplace now serves modern pilgrims. Interesting, the local cow’s milk cheese called tetilla or perilla produced the best cheesecake that we have ever had anywhere! 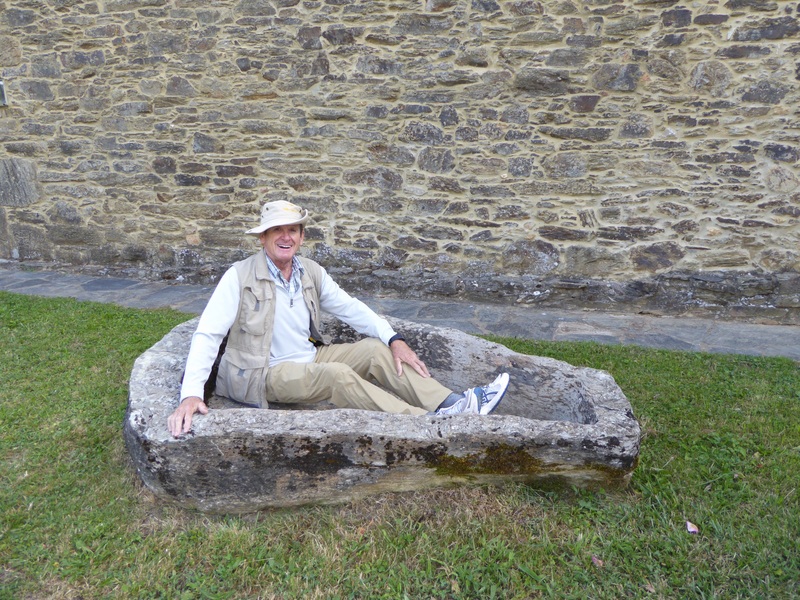 After a long day on the Camino, there is nothing better than to soak away your aches in a tub. 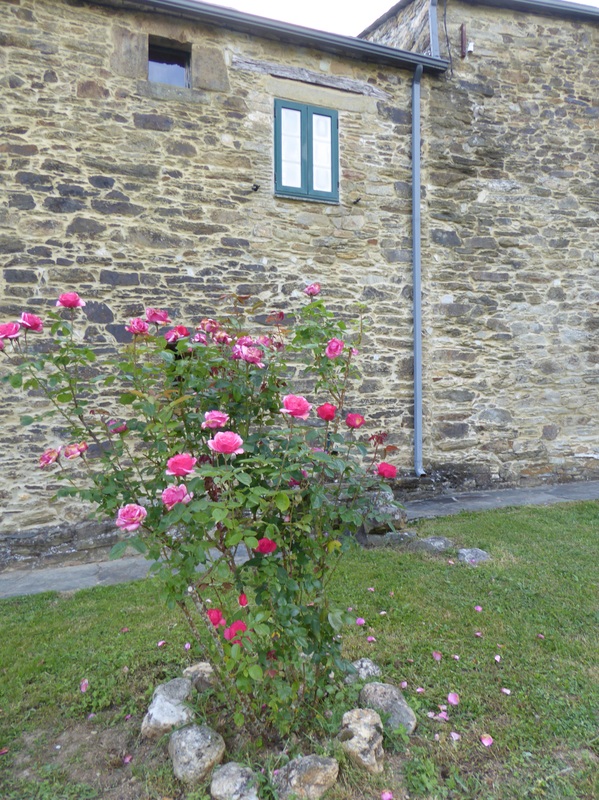 Roses, roses roses everywhere on the Camino. Here outside the manor house. 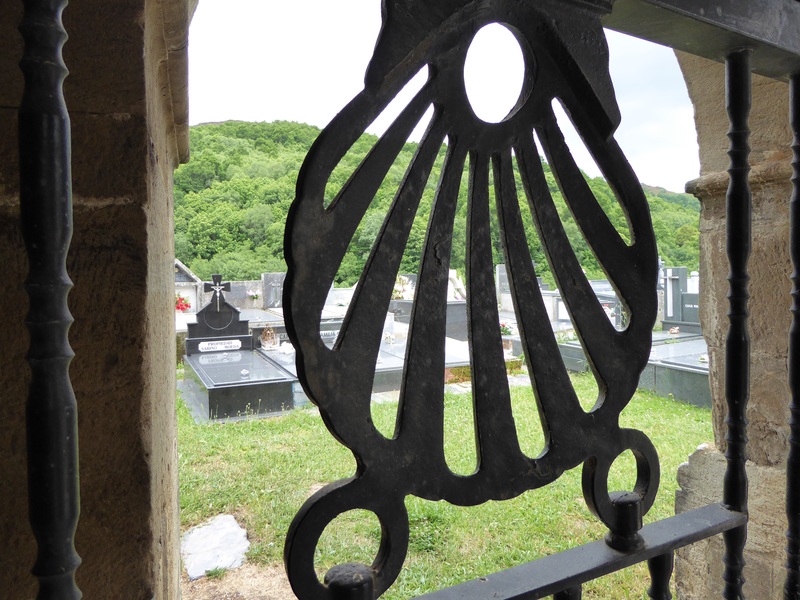 The iron scallop shell symbol of the Camino in the gate of the old church where we later attended evening mass.